One of my rooms. Just in case you thought I was exagerating about how humble some of the accommodation has been! One of the guest houses. Picture – Kim and Tendi with our horses. Tendi and I on our ride back from the caves. Except for our modern clothes we could be Tabetan traders coming to LoManthang 500 years ago. Not too much has changed since then. Me with Tendi and Tsheri near one of many passes we crossed in the Upper Mustang. We departed Marpha at our usual 7:30 then put in a longer than normal day. As a result we are now in Ghasa nestled at the foot of Annapurna I. The scenery has changed enormously. We are in the deepest gorge on the planet, Kali Gandaki, and are surrounded by pine and fir trees and …. wait for it…… bamboo and marihuana shrubs taller than me. Slopes rise steeply above us to the rocky crags and cliffs of 7000 to over 8000 metre high mountains. They seem particularly high from our current vantage point of a mere 2000 meters! My day’s bliss was two fold. This morning our “tea break” place happened to serve cappuccinos. I could not resist, so sat in the sun and sipped a most delicious and incredibly caffeinated coffee. It gave me quite the buzz. Not sure if it was the quality of bean of the fact I’m not drinking much in the way of coffee these days. The second bliss was a hot shower a few minutes ago. Too nice for words! And the bathroom wasn’t even that cold so it was all good. Well I have the funniest story to tell you about today. We did a fair bit of road walking and it was essentially all downhill. The road is very rough and we were plodding along at a brisk pace. Suddenly I caught my toe on a protruding rock and down I went onto my hands and knees. Because of the downward slope, and the forward momentum of my pack, my body carried on forward onto my head. So there I was in a sort of Muslim prayer position in the middle of the road. To add hilarity to the picture – this section or road was running with a stream of icy cold water. Tendi had the grace to not laugh, in fact he looked a bit worried. But very soon, once I was upright again and we all realized that I was wet – head to toe – but otherwise unharmed, we fell to laughing. That afternoon we were in Tatopani so I soaked my cares away in the hot springs there. Ah that was so lovely to be immersed in really hot water! Today’s trek was only three hours but every single step was up hill and most of those steps were up stone stair cases! We’re now in Ghorepani. (2860 metres) yesterday we’d been at our guest house for about 30 minutes when clouds came broiling down over the peaks above and it began to deluge. The rain carried on – off and on – for the rest of the day. Today the same thing has happened. I’m so glad we are tucked into a guesthouse, cold as it is, we are dry. Because we are quite a bit higher here were in the clouds so it’s a pretty dismal scene outside the windows. After I send this I shall curl up in my sleeping bag for an afternoon’s reading. This is the hard part of trekking for me. Short walking days with long cold afternoons to abide. It’s easy when the sun shines, hours spent in the warmth go by so much quicker. “Why not walk further than?” you may ask. Well three hours of steady “up and up” is hard work and to go on to the next hamlet on our route is another 6 to 7 hard hours of up and up and down and down. Too much for today. Three people have just arrived and they are sopping wet and look half frozen. So are tough as it is to be here, it would be worse to be out in the current weather. 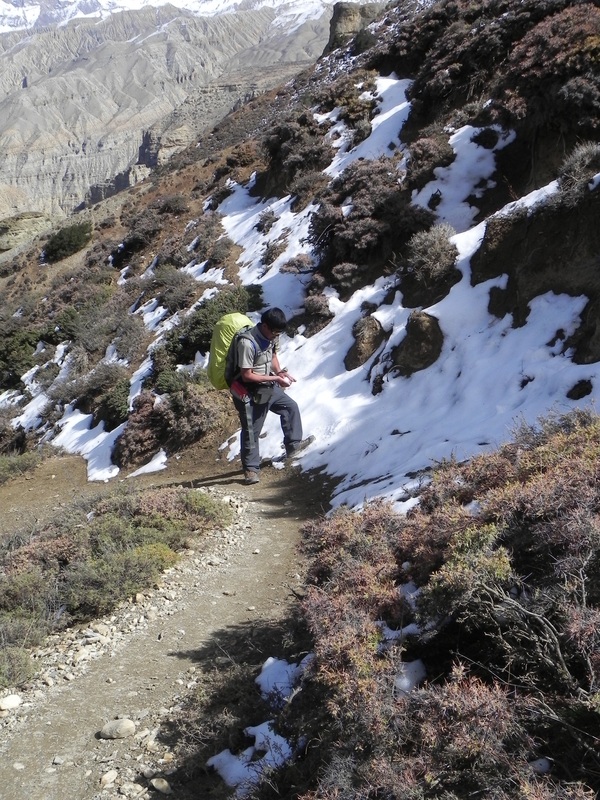 Unfortunately these unseasonable rainstorms may be putting the kibosh on our Annapurna Sanctuary plans. Rain here means snow there, and snow there can mean serious avalanches. Don’t worry we’ll not go if there is a risk. In case you are wondering what it is with all these “pani” places…..Tatopani means hot water. Named so for the hot springs. Ghorepani means horse water. Named so because horses drink water here after their long climb up to this place. Tomorrow we will be staying in Tadapani. Named so because it is far from a water source. Well I think that’s it from me until this trek is done. I don’t believe we’ll be in any other places with wifi. 21 Oct. We’ve begun the return journey. Some of it on different trails, but for sections we retrace our steps. however going the opposite direction changes the view so none of it feels old. Now the Himalaya range to our south seems to grow taller and bigger as we descend towards it. There is still an abnormally low snow line for this time of year. I’m not going to give you a daily report of our southern bound trek. I think I’ve said as much as needs saying about what this incredibly harsh but beautiful part of the world is like. 23 Oct. Just yesterday Tendi received a call from Binod with news that my neighbours Barry and Diane called him wondering if I was OK. At the same time we discovered that the storm of 14 Oct resulted in a much greater loss of human life throughout the region than we’d been aware of. Barry and Diane thanks for taking the time to track me down and check on my well being – that means a great deal to me. Sorry for any worries any of you may have had. Once blogs start coming from me again you will read of my wet experiences during that storm. We were close to the disaster zone but happily not caught up in the blizzards. Tendi is a wise mountain man – he’d not have had us out in that kind of weather. It started at night so unless people were camping, we are puzzled as to why so many were trying to cross any of those passes in blizzard conditions. We witnessed some of the body recovery the following day and the Nepali news had coverage but we thought it was a local tragedy and had no idea the thing involved so much of the Annapurna region would make international news. You probably know more about what happened than we do. 24 Oct. We are now back in Kagbeni. 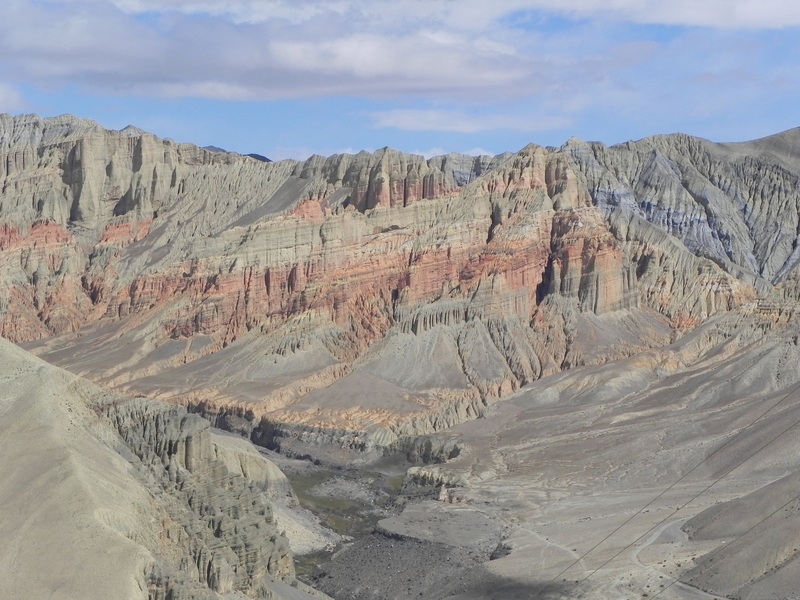 The Upper Mustang portion of this trek is over. It was a tough one for sure but I’m very glad to have gone there to see and experience the place. After washing my filthy laundry – while showering – I took Tendi and my new porter, Furi, for a Cappuccino. Furi liked it but Tendi was hilarious! To say he likes Cappuccinos as much as I like Sherpa Yak Butter tea would not be an understatement! However he drank it and I’ve thus been challenged to drink Sherpa tea with him in his village when Karin and I go there later this month. The reason I have a new porter is because Tsheri has returned to school in Kathmandu, the festival holiday season now being over. Tomorrow I should have internet so hopefully I’ll be able to send you all news that I’m well, happy and enjoying myself! The day I’ve been waiting for! 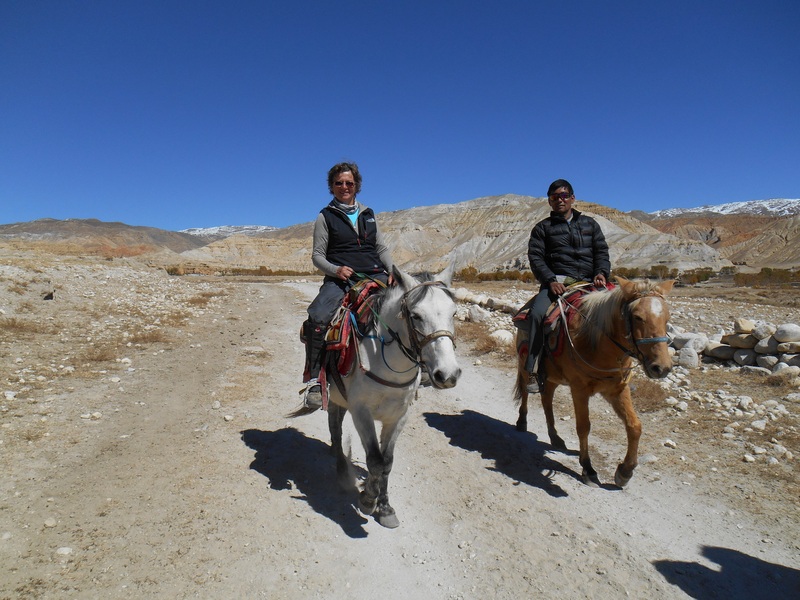 Today we rode horses up to the Jhong caves North of Lo-Manthang. The horses are outside our guest house by 8am – three small sturdy creatures. Tsheri and I ride two that are from Tibet and Tendi gets a local horse. I’m not sure what the distinction means. My horse had recently come fourth in a cross country race so he’s considered a very fine beast and he’s the lead horse. I ask how this will work as I don’t know the way. The horse man smiles and says “Horse knows way. Horse name Okay.” Alrighty then, I now have all the info I could possibly need for the day’s outing. A horse that knows where we are headed that I can talk to by name should I so desire. Off we go. Okay does know the way. He’s a clever wee beast and as such sometimes goes the wrong way to explore this or that on his own. Of course the other two horses follow and the horse man has to sort us all out and get us pointed in the correct direction again. We ford many steams and climb a few narrow paths and cross three tiny wooden bridges. At one point we are surrounded by a huge flock of goats and passed by that now repaired motor cycle. Nothing phases our little mounts. They just bob along, their bells ringing a merry tune. Up hill or down they keep a pretty steady pace. Their saddles are Tibetan style. Beautiful embroidered saddle blankets extend well past the saddles and partially cover their flanks. The saddle sits on that then another smaller but equally colourful thick cushion covers the saddle. The rider sits up on top of this pile – there is little by way of pummel or horn at all. However it’s comfortable and seems effective. Okay dutifully trots into a path-side “Cafe.” I use the term very loosely – a sort of truck stop with horses instead of trucks might be a better analogy. Then he stops. The other two horse stop too. We have arrived somewhere. It’s tea time. So we dismount and have tea while the horses just stroll around completely free. Tea complete, cookies fed to the horses and our horse man, Tendi, Tsheri, and I continue up the valley on foot to visit the caves. These are actually 2500 year old apartments carved out of the sandstone rock. 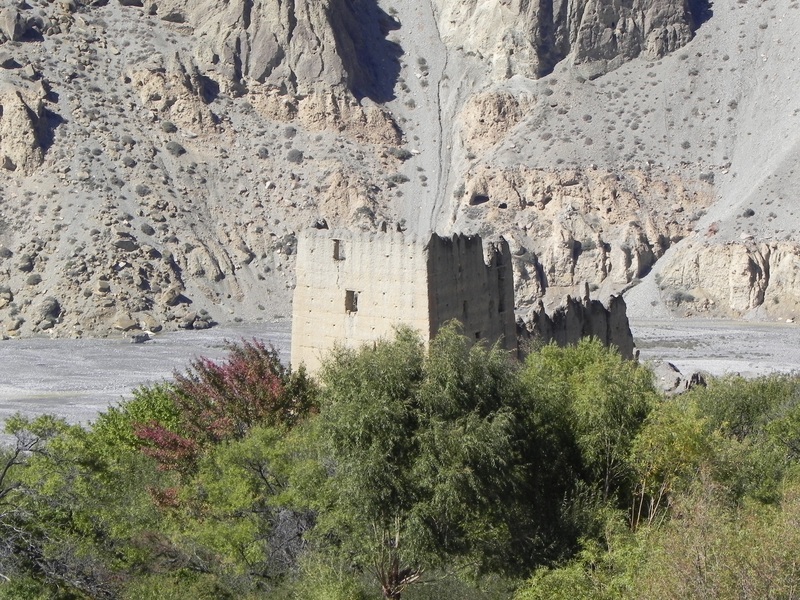 Legend has it that at some point marauding Tibetans laid siege to the caves. The villagers had hidden in them to protect themselves from the attack. The besieged villagers were running out of water so the women rinsed their hair in oil and stood combing and “drying” it by the windows. When the Tibetans saw this they gave up the siege as they figured the villagers had an endless supply of water. True or not, the caves have but one tricky entrance, are extensive and rise five or six or more stores above each other and extend far back into the rock. The rooms have little windows in their walls so that outside air and a bit of light can ventilate the inner areas. Some rooms have blackened ceilings from long-ago fires. There are storage areas made from built up stone walls. The outer walls have larger windows. Looking out one of the top floor windows we are amazed to see a veritable stream of fellow tourists climbing up to the entrance. Looking back down the valley we can see dozens of horses milling around the “truck stop.” I’m sure not the only tourist here! But have been so lucky to have avoided the masses till now. And as we are finished with our explorations, having climbed every ladder and looked out every window and peeked into every room, it’s time to go. Next stop is a monastery built into a cliff and then back to our horses. The truck stop is just too seedy for words so we hop back on our trusty wee steeds and ride back to town for a late lunch. The afternoon I spend doing laundry, having a shower – this is a simultaneous activity. Hanging laundry in the sun, reading in the sun, then dashing inside as the cool on the evening hits with a vengeance. I’d planned on spending an extra day here but we decide to head out tomorrow. The cold is intense at night. And other than in a wind-sheltered outside place in the sun, the daytime temperatures are a bit cool for sitting around. Inside the buildings is uncomfortably chilly all the time. I’ve seen what’s to be seen. It’s time to head back. But we’ll return by a partially different route and take four instead of three days to keep things interesting. Good night from one who has happily ridden a Tibetan horse in the ancient kingdom of Lo! My sleep last night wasn’t as undisturbed as I could have wished however the reasons for the disturbances were unique to say the least. Small birds clearly found the inside ceiling with all the dried branches a warmer more sheltered place to cozy up for the night than outside. And seeing as there is the convenient hole through which they can flutter in and out at will, they made full use of my ceiling. This caused a fair bit of ominous rustling in the dark. My first thought was rats! Flashlight trained on the sounds I was relieved to discover nothing worse than birds. I moved my boots from possible line of fire should any of the little dears decide to drop anything. Soon back to sleep I was next awakened by tinkling bells just below my window. Nothing ominous in that but curiosity required I discover the source. Two horses were outside doing whatever it is they do at night. This caused their neck bells to tinkle every time they moved. They moved around quite a bit seeking wee bites to eat and rubbing each other’s necks. Between rustling birds and tinkling horses there was the more tranquil pursuit of watching the twinkle of stars. With no lights from the village, no air pollution nor a moon, they had a diamond bright quality we seldom get to experience. I was awake again to watch them fade as the sun began to climb up from behind the eastern peaks. Dawn comes very quickly here and in no time the day had begun. Daily at 6:15am I conduct my “within bed” dressing. I’ve taken to sleeping with my daytime clothes bundled into my sleeping bag with me. They are much warmer to put on that way. My top gets undressed, washed, and dressed first while I still have residual sleep warmth. Then I reluctantly exit the warm cocoon of the sleeping bag and do the bottom half as fast as humanly possible. Next is the teeth brushing which is always an adventure. Inside? Outside? Wherever, it is always with my trusty cup of drinking water. Nothing that comes out of a tap in this country is drinking water so my teeth are done with aid of a cup of previously prepared potable water. These days that means the now cold, hot water I tucked into the bottom of my sleeping bag in my metal water bottle the night before. The tooth brushing adventure complete it’s time to pack up blanket, sleeping bag and all my assorted bits and bobs. I carry the bulky light stuff. Tsheri carries the heavier stuff. While I eat breakfast he packs those bits and bobs into his back and then we’re good to go. We usually set off at 7:30 each morning. 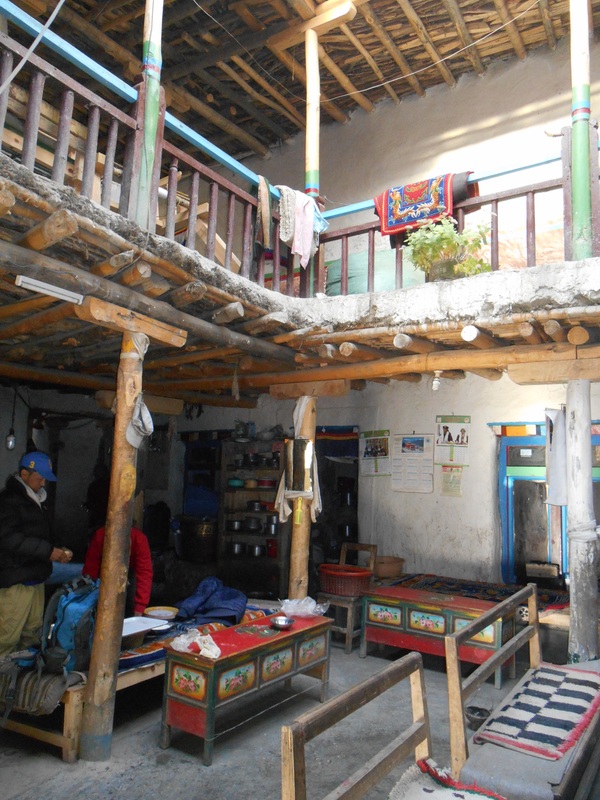 We started today checking out the village monastery, then returned to our peculiar digs to collect packs and set out on the last few hours of the trek to the capital of Upper Mustang. With only one pass of any significance to cross it was a comparatively easy walk. After about four hours we came round a corner and there before us lay LoManthang. With the exception of the great red wall surrounding the oldest part of the city it really doesn’t look much different from the villages we’ve visited enroute. We descended the last stretch of our journey to this fabled ancient city. It’s outer streets are quite wide, dusty where they are dry and slimy with mud where they are wet. There are still a few piles of snow around from the storm. Water channels run randomly along or transecting the streets. Wherever water wants to go, these cement or stone channels have been built to keep it sort of controlled. It works quite well. People are out in the streets doing all sort of thIngs such as washing dishes or clothes, carding wool, carrying stuff or in one or two cases just sitting enjoying the sun. Our guest house is the same plan as the rest in this area. Big square two floored building with the second floor balcony surrounding the inner court yard. My room is wee small. One single bed and a tiny table no room to swing a cat for sure. It’s perfectly adequate and the ceiling has no hole in it. This place is very high class there is a sink outside the toilet and there is hot water for a shower! I’m in heaven. We set off to explore inside the walls – in other words – the old part of town. Here the streets are narrow and windy and in about two minutes I’m lost. So I just follow Tendi along. We were supposed to see the king but he is in Kathmandu receiving medical treatment. He’s old and not well. Instead we go to the biggest temple and spend an hour or so with a very well travelled interesting monk. His English is really good. He’s been to Vancouver and various places in Europe including the UK. He offers to answer questions and so I bring it on. It is a very enlightening hour indeed. He takes us to see some ancient pre Buddhism artifacts which have been found in the area indicating shamanism was the ideology here before Tibetan Buddhism took hold. We saw rare ancient texts – 2500 years old – and all manner of peculiar and fantastical stuff. Next we went and enjoyed a Tibetan Buddhist… Not really sure what it’s called – monks chanting and playing all those amazing weird sounding instruments, drums, cymbals, short horns and those huge long horns. Very cool. The narrow streets are intersected with squares surrounded by shops. More interesting than the wares within – I can not shop as Tsheri already has a big enough load – is life taking place on the sunny sides of each square. In one there was a group of women all combing each other’s hair. In another women are carding wool. In the next is a group of young men tinkering with a mother cycle while an older man spins his prayer wheel and simultaneously seems to be giving advice about how to fix the thing. For sure the bike is a very incongruous entity. In shady areas we have to climb over quite high banks of snow. That storm sure dumped a lot of snow. There is still a great deal of evidence of it. The exploring complete we return to our guest house. I’m more than thrilled to be here. It is an incredibly unique corner of the world and as yet fairly unmarried by the downsides of modern civilization. Well except for that motor bike! I embrace the fact that this guest house has power on at 6pm for a couple of hours! Sheer luxury. Today was a fairly long one with two passes to climb up to and descend from but none of the ascents or descents were as challenging as yesterday. The scenery continues to astound. It is stark. Except for in the immediate vicinity of the few villages we pass, there is virtually no vegetation. Goats roam the hills seeking meagre sustenance. Cows and horses are hand fed with grain gown in stone walled fields near the villages. Presumably the stone walls exist to keep the goats out. There are trees such as willow, poplar, and apple planted near and throughout the villages as well. 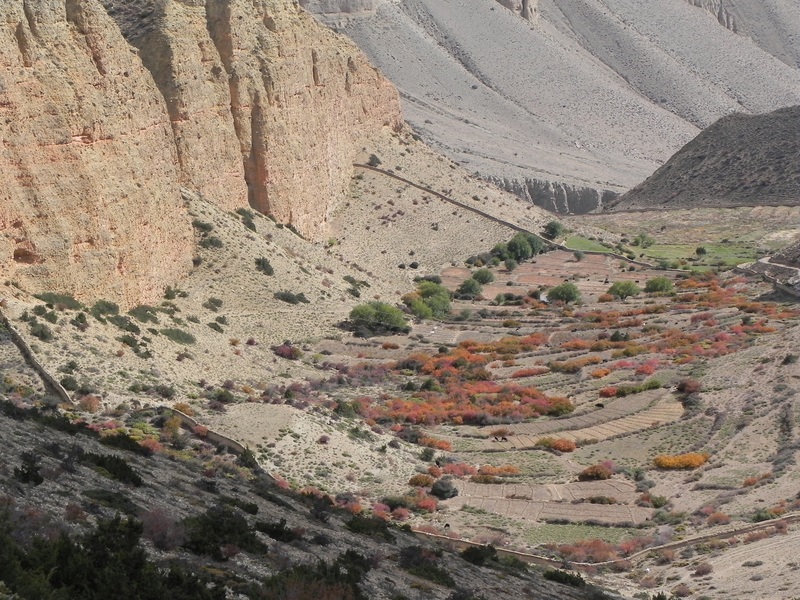 At the moment they are changing colour and the bright yellow of the poplar mingled with the still vivid green of the willow and the red bedecked apple trees stand out against the red, grey and brown of the surrounding barren hills. We’ve dropped back below the snow line today so the contrast of white against reddish brown is no longer a relief as the eye wanders across the vast expanses of rolling hills interspersed with deep canyons and eroded cliffs. Now those cliffs and canyons are quite amazing to behold! They offer contrast of colour from bright reds to light greys! I feel I’m doing an inadequate job of describing this remarkable countryside but let me see if I can describe where we are staying this evening. It is by far the most peculiar place I’ve ever spent a night. It is a sort of guesthouse but not really. Whatever that is supposed to mean escapes me. We are all up stairs on the second floor of a two story building. There is a courtyard in the centre and a railing on the second surrounds this open area. Rooms extend off into the outer walls of the place. I was shown one enormous room with about six beds and masses of benches and a huge stack of mats and lord knows what else. Obviously this space was more a store room then bed room. Tendi read my dumbfounded silence correctly and asked if there was a smaller room. Yes there was – so we were shown across the balcony to another with only four beds and a pile of filthy blankets. I said I’d take it. Now let me explain this room a little. The floor is lined with cardboard on top of which is filthy thin torn Lino. The beds are rough cut wood frames with metal slats and a thin pad covered with a filthy piece of cloth. The pillow – I’ve never encountered anything so weird – it’s heavy, hard, covered in plastic that makes a loud crackling noise under a disgusting nylon cover. Needless to say I’m going pillow-less tonight. There is a tiny dirty window but light also comes into the room through a one foot square hole in the ceiling. This not only lets in light but air as well as it is an open hole. The hole is cut through the rough sticks, shrub branches and mud that make up the ceiling. 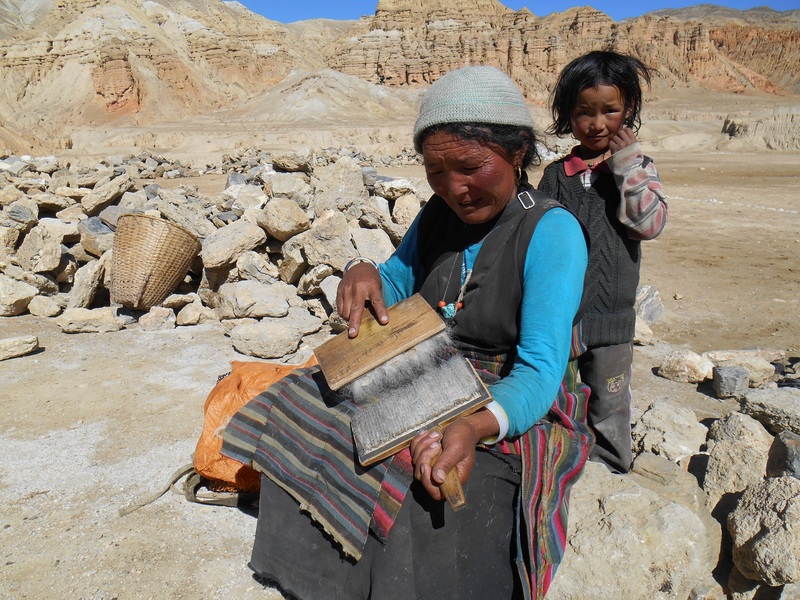 Wattle and daub is alive and well in the Upper Mustang. There of course no heat or light in this, or any other, room in this establishment. 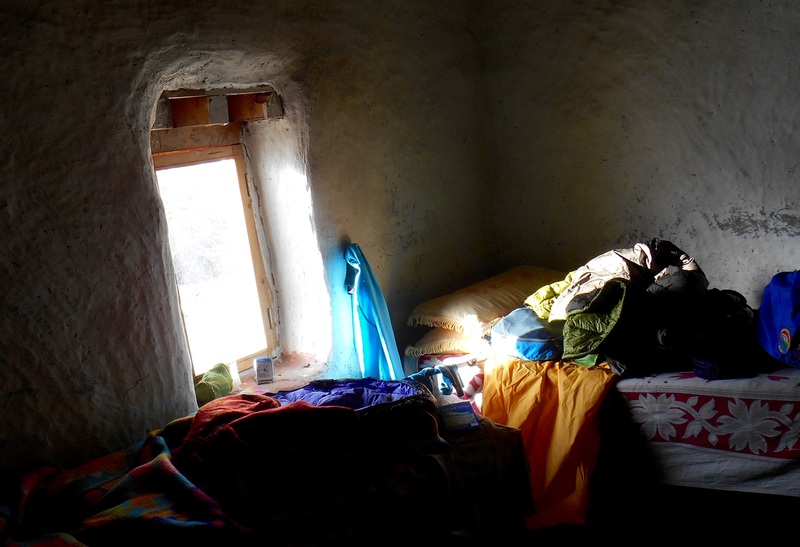 Once settled in, as much as one does in a place like this, Tendi brought me my tea and word that there was no cook. He would make me dinner. What would I like? We went through several computations before discovering something he could put together with the meagre supplies in the kitchen. Remember he is searching a strange kitchen that is poorly supplied with anything without the benefit of light other than his head lamp. So for dinner I’ve had boiled potatoes, with a very small amount of some sort of green leafed veggie on top covered with very dried out shredded cheese. No sauce or butter – there isn’t any. He’s currently trying to figure out what he can put together for breakfast. There is also a very pleasant Italian couple, father and son staying here. They are taking the whole thing in stride. They arrived after me so are staying in the store room. Then there are five obnoxious French people. They seem completely incapable of understanding no power, lack of a cook, lack of supplies……the Italians and I are enjoying a bit of a chuckle at their expense. But it is now time for me to sign off and make my way to my room, remove sandals and pants and climb into my sleeping bag otherwise fully clothed..Which includes four top layers, or maybe it’s five, plus my down jacket…Good night from Tsarang (3560m).